Put back in restart, shutdown, and updater tools. Menu will now notify you if there are updates available. I’ve started playing with Notro’s FBTFT module again. This allows you to use little inexpensive LCD screens for things like the console and X Windows. The problem is that most programs expect output on framebuffer 0. These screens operate on framebuffer 1, or /dev/fb1. Tasanakorn has created a program called fbcp. This mirrors the screen from the hdmi / rca port and onto the SPI based screens you see above. It doesn’t work 100% yet for me. I don’t know if its my screen or the program. I’m going to purchase some more and test them out. 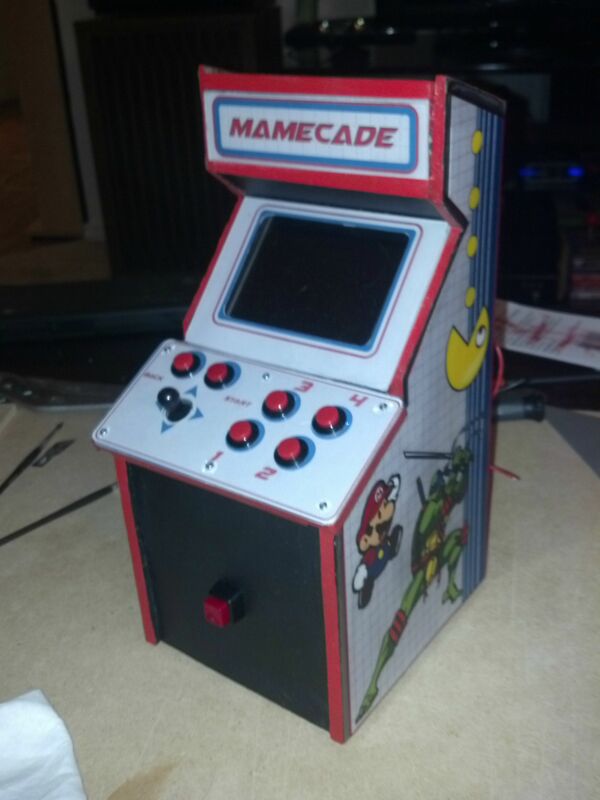 Steve Smith has created this awesome little MAME cabinet. Plans and more images are below at the imgur link. Lazzarusbr posted this custom bootsplash video on the PiMAME forums the other day. It’s so well done. I wish I could officially include this. I hope to see some more awesome bootsplash videos in the future. New week, new revisions to PiMAME 0.8. Shutdown, Restart, and Update commands. A notice in the menu when a new update is available. I can’t believe it has been one year already since K and I got married. A year has flown by. To my wife, I love you, and too many more wonderful years going on silly adventures. Happy Friday! I got an email this morning from Packt giving me the stats for my book sales from October to December of 2013. I’m happy to report that I have sold over 200 copies. Thank you all so much! Friday Post: PiMAME 0.8 Update and some stats! It’s been a week since PiMAME 0.8 Beta 1 has been released and there has been great feedback. This update includes Commodore 64 support and fixed NES emulation. In one week, PiMAME 0.8 has been downloaded from SourceForge over 400 times. My server (which hosts a mirror copy) has transferred 84GB in 5 days. My usual monthly bandwidth is 30-40GB. I’m excited about this release. There are bugs, but they are getting fixed, and this version has a great new foundation to grow on. Thank you all for the feedback, suggestions, complaints, issues, and support!